The magnificent Rosella (Hibiscus sabdariffa) is the first offering in our native Herb & Veggie range. Funnily enough, the Rosella is technically not a herb or veggie, nor is it originally Australian! Thought to have originated in Central Asia and been introduced by Indonesian fisherman, Rosellas have been growing here for thousands of years, acclimatising to Australia’s unique environment. Despite all being the same species, the Hibiscus sabdariffa that grows on home soil is different to the varieties that grow in New Guinea, Indonesia and China. Rosella bushes produce fleshy calyxes after flowering. Most commonly, you’ll find them cooked into jams, preserved whole in syrups, and often used as a decorative and flavoursome addition to cocktails, white wine or champagne. The leaves, also referred to as ‘red sorrel’, are edible too – usually steamed or stir-fried like spinach. This season’s Tucker Bush Rosellas were grown with love in our nursery in the Perth hills, hardened off under the WA summer sun. 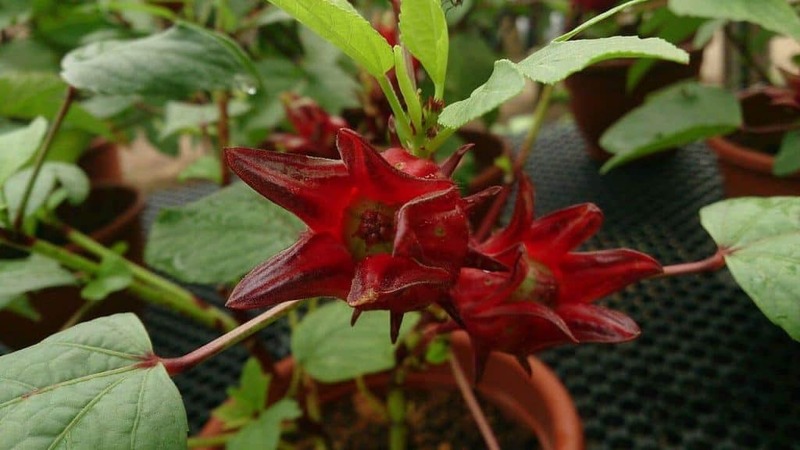 Rosella is a hardy plant that grows fast in warm weather. It can survive dry conditions, but does best when planted in fertile, well-drained soil and given plenty of water. See how to make Rosella jam.